Since our plans to visit the castle turned into going snorkeling on Saturday, we decided to go up the mountain to visit the Castillo de Santa Bárbara on Sunday morning. We neared the mountain on foot, not sure how to get to the top. We circled the hill at the bottom, going about halfway around until we found some paths leading up near tourist signs for Castillo de Santa Bárbara. Dead end, and we're walled in! We walked back, then saw a lower path that was just as prominent as the road we'd come from. There was also a man out on the path, so I was going to ask him how we get to the castle. As I approached, he told me the road he was on was a dead end. So I asked him how to get to the top. He said we needed to go back down, and around to the other side of the mountain: the side we had come from. Really? I asked, while pointing towards the way we'd originally started, that way? Yes, yes, he said. Le sigh. So we climbed all the way back down and had to decide if we'd return to where we originally started, or try to find an entrance on another side of the mountain. We decided to try another side, so we walked around the base through town. I saw two Spanish women walking down a steep road, so I asked them if we could get up to the castle that way. They said yes, go down a ways and you'll see a park. You have to go through the park to get to the castle. BINGO! We went that way and found the park. Many stairs later, we finally reached the top! 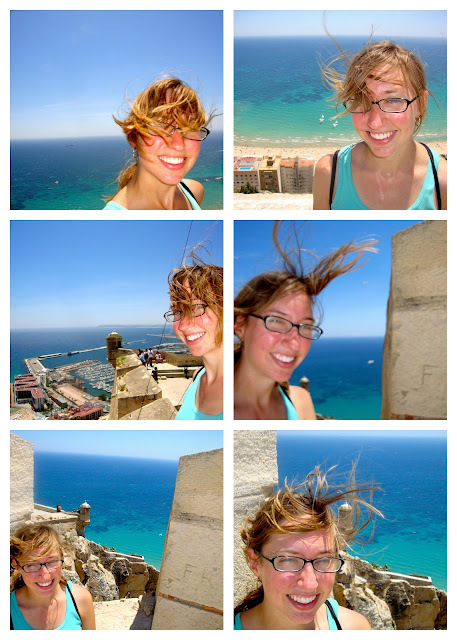 Proof that we finally made it to Santa Bárbara Castle! After leaving the castle, we found a place for lunch where Chad could finally try paella, a famous Spanish rice dish. 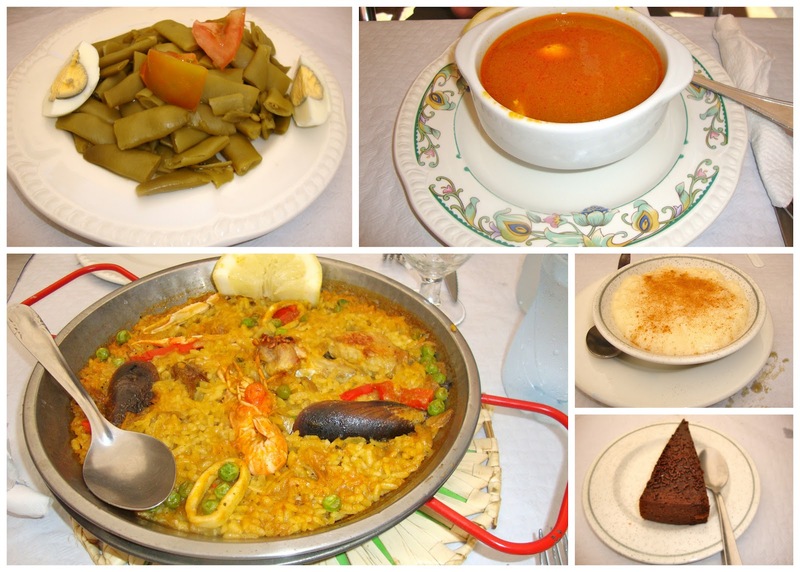 We each got a menú del día with paella as the second course. Chad tried arroz con leche (rice pudding) at the end -- a very typical Spanish dessert. Near the restaurant we saw these large statues of er, some kind of people. I'm not sure why they were there; maybe it had to do with whatever they were celebrating last night when we saw the parade. In any case, we took pictures. Before we left the hostel, Chad and I each signed one of the walls in the first floor. Can you find where we wrote? On the way out of Alicante I took a picture of the pretty purple flowers that greeted us when we arrived. There were also these two bears made of ummm, no idea. (I said grass clippings or something, Chad says no way). I could hardly believe it. What had started out as a reading competition between Chad and I (I had been trying to catch up to his page number all weekend, since he'd started his book earlier in the week but I started mine on Friday) turned into a reading competition between me and the movie. The movie won, but later that night at 9:17 I finally caught up to Chad's page number. In his defense, I think my book had a bigger font, and it's a huge page turner. It was a great, relaxing weekend on the coast; and we both tried new things. A weekend well-spent in my book.